We all experience stress in our jobs, even if we’re working at our “dream job.” That’s because every job entails a certain amount of responsibility. Unless you don’t care a bit about your job – in which case, you won’t be employed much longer – you make every effort to fulfill your responsibilities; and that can cause stress, particularly when you’re “under the gun” in terms of a project, deadline, presentation, etc. 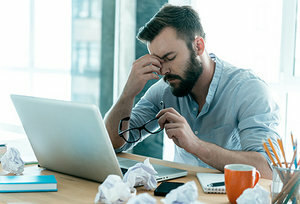 Workplace stress also can manifest because your job is your source of income, and the prospect of losing that income (which in most cases, is always a threat, whether real or perceived) can be frightening. Add in the sometimes-contentious interactions with your boss, co-workers and other parties with whom you interact, and that stress can simmer slowly or boil over in a moment’s notice. Most people have enough stress in their lives – add workplace-related stress and you could be concocting a recipe for disaster. Two solutions: Find ways to better manage the sources of stress (so you don’t experience stress int he first place; or learn how to reduce the impact stress has on you when it inevitably rears its ugly head. Click here for some simple stress-management strategies to help get you started.